Ancient Trader from 4Kids Games is a fairly simple board/strategy game that puts you out on the high seas moving and trading your various goods from port to port in an attempt to amass wealth, upgrade your ship, find each of three treasures, and eventually take down the map's Ancient Guardian (some big sea monster) before any of the other players do the same. Along the way, you'll explore the map, find money and cargo, take on simple quests, fight other sea monsters, and even battle other ships. And you'll have to do it in my favorite way ever: taking turns. Once you get into your first game, you'll notice that the game, though simple, is gorgeous. Your play map is an actual map. 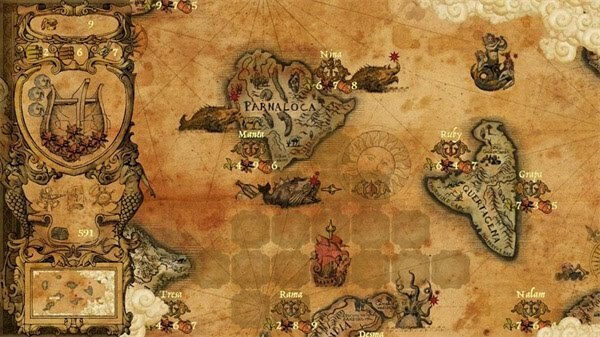 An ancient-looking sepia-toned drawing-filled map brought to life with movement from not only your ships and the sea monsters but also the occasional wave or jumping fish. Even the fog that covers the parts of the map you haven't explored yet looks like it belongs on the map itself to serve as either an invitation to explore or a warning that here be monsters. The drawback of the theme of the game is that the text, a very old map appropriate text, is small and somewhat difficult to read. Luckily, outside of the manual, there isn't much text to be read. The music, on default, is difficult to hear. Even after turning its volume to 80% (the effects are on 30%), the effects still drown out the music itself at times. A slight shame as the music quality is decent but mostly atmospheric. The controls take a little getting used to with a lot of different menus to navigate. The standard of A as accept and B as cancel apply, but X opens your quest and information menu, LB and RB scroll through different menus while pushing left or right will change the quantity of your trades, and it's all just something you get used to over time. One addition that would be nice is an "end turn" button instead of having to either spend all your movement and click on something or find a spot that you can't actually move to and click that if you still have movement left. Again, something you get used to and not a deal breaker at all, but a weird oversight. Otherwise, it's a turn-based game and, because of that, difficult to mess up outside of bad planning or something. Anyone looking for the normal XBLIG staples such as leaderboards, pseudo-achievements, unlockables and the like will be disappointed as there aren't any here. On the other hand, there are nine specific single player maps across three difficulties along with random ones for each of the three sizes, multiplayer that can be played with one controller or everyone having their own, system link multiplayer, and online multiplayer. And each one customizable for map size and win condition. (Kind of makes sense, as really what would you unlock with a board game?) So, as you can expect, multiplayer is a huge draw and can last for many, many nights of fun. Even as a single-player experience, if you decide to complete the nine maps you'll be busy for more than a few hours, and that's if you do everything on the first try. The harder difficulties have your opponents starting out a lot more decked out, so your work is cut out for you. Fans of strategy games and board games should at least give this game a try, and those fans that have friends around will definitely get the admission price's worth out of this and then some. Ancient Trader from 4Kids Games is available on XBox Live for 240 MS Points. Played a map from each difficulty level, got schooled by the computer on Hard like it was its job, and played a level against, uh, myself just to see how multiplayer was. If anyone wants to play this with me, please, for the love of everything holy, let me know.